The only thing you have to consider is whether you are an ocean or a mountain person; whether you prefer the sandy beaches San Juan del Sur, or the undulating landscapes of Matagalpa. To help you make your decision, here are some comparisons of these two great places to live in Nicaragua. San Juan del Sur: A funky, colorful beach town, sitting on a beautiful bay with spectacular sunsets. International food galore and live music to suit any taste. Warm summer breezes and temperatures in the 80s F all year long. Matagalpa: A charming city with all the amenities you need nestled on the side of a mountain. Hiking trails, waterfalls, rivers and streams, and all sorts of birds—this place is for the nature lovers. Called the city of “eternal spring,” Matagalpa’s climate is close to that of San Diego. Not too hot, not too cold, but just right. San Juan del Sur: The sign says 18,000, yet it feels like there are less. This number would include all outlying pueblos and neighborhoods surrounding the city. Matagalpa: This is a city of around 250,000, which means it’s bustling and moving, and has a growing middle class. San Juan del Sur: Since it’s a beach town, San Juan del Sur is more expensive than other parts of the country. Some restaurants charge up to $20 for a lobster dinner and $6 cocktails. A couple can still manage on $1,500 a month for everything, but prices are going up because of all the tourists it attracts. Matagalpa: A couple can live here for $1,200 a month, and even less if they budget their money. San Juan del Sur: Due to the number of expats living here and the tourists who generally use English as the common spoken language, you can get by in the city itself with English alone. But you’ll need Spanish to communicate with the locals. 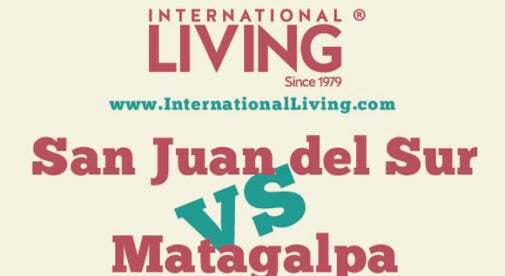 Matagalpa: Since expats are just starting to move here, Spanish is a must. Without a basic knowledge of Spanish, you’ll have trouble communicating with store clerks, the police, lawyers, most doctors, and virtually everyone else. San Juan del Sur: Prices are increasing, but you can still find one-bedroom furnished apartments about three blocks from the beach for around $400. Add at least $300 if you want an ocean view. Matagalpa: There are new residential developments where you can rent a two-bedroom, two-bathroom house for between $250 and $300. On the outskirts of town, you can find fine apartments for $200 a month. San Juan del Sur: An ocean-view property with two bedrooms, and two bathrooms in town is on the market for $107,000. Another property with an ocean view is $175,000. Smaller homes in local communities cost about $40,000. Matagalpa: A new housing community with two bedrooms and two bathrooms costs about $33,000. Old colonial fixer-uppers in the town center and smaller properties start at $60,000. San Jual del Sur: After Granada, San Juan del Sur has the biggest expat community in Nicaragua, with expats from all over the world. Matagalpa: Expats are just starting to arrive here, and when they do, they tend to flock together. So it is only a matter of time before Matagalpa has a large expat community. San Juan del Sur: There is one public clinic that is good for non-serious ailments. There are also pharmacies where you can usually buy familiar drugs without a doctor’s signature. But if you have an emergency, you’ll have to go to either Rivas (30 minutes away) or Managua (two hours away). Costs are a small fraction of the cost of the U.S.
Matagalpa: There are two very good hospitals, a variety of private clinics, and doctors who do house calls here. In severe cases, you would have to go to the Metropolitano hospital in Managua.